Sniper X is an expert advisor using customized indicators to identify trend reversals. The entries are usually accurate and in case if the trend reverse with a delay the positions will be managed by a smart grid system which can be enabled. The EA is created to handle multiple trades when Grid is enabled by using the same magic number. When the EA reads an open trade the EA will not open another trade. If two trades are opened at the same time which will be very rare, the EA will set both trades' take profit and stop loss to 10, as one reaches the take profit or stop loss the other trade will carry on as normal. A disaster recovery mode have also been implemented to restore grid system in case the EA has been shut down for unexpected reasons. Warning! 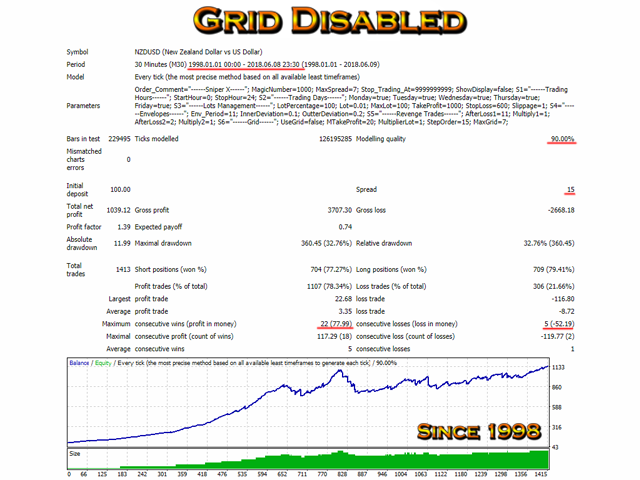 Grid use have high risk. Recommend to use with low deposit amount and constantly withdraw profits. Do not trade any other trades while this EA has trades open, when grid enabled! 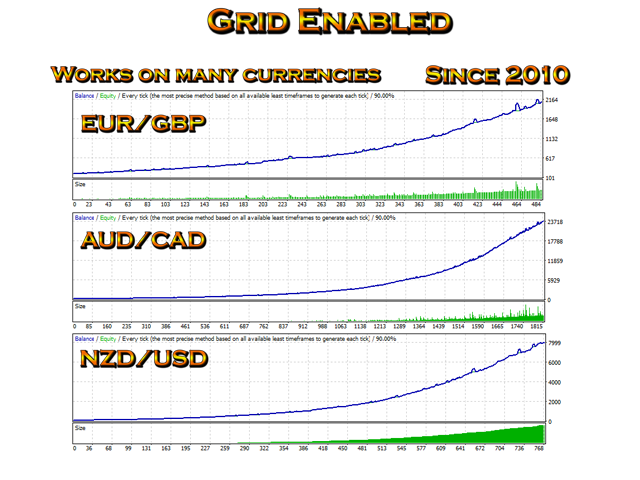 By optimizing any currency pair this EA can be used on almost any currency pairs and timeframe. Minimum recommended deposit is $50 and $200 for Grid use. Broker with low spread is recommended to get better results and more profits. Compatible with 4 and 5 digits accounts. Strategy - Strategy 1 are mostly used. Strategy 2 does more trades. Strategy 3 has no extra filters. Stop_Trading_At - Stop trading when this account balance is reached. ShowDisplay - Enable or Disable the display, for backtesting disable the display to build faster. StopTrade - Stop Trading when current price is in the distance before switching positions. CloseTrade - Close Trade before switching positions. Pips - The distance in pips before switching positions. Trademode - Choose to backtest with newsfilter or to use on live account. CloseOrderOnNews - Close orders when the news start. LowNews - Enable/Disable for low news. LowIndentBefore - Stop opening trades, x minutes before news starts. LowIndentAfter - Start trading after x minutes. NFPNews - For Non-Farm Payroll news. OnlySymbolNews - Filter news only on current pair or for all the news in all pairs. TakeProfitAt - Choose where to take profit. TrailingStop - Choose Trailing in TakeProfitAt to use this input. LotType - Choose to use FixedLot or account balance amount. LotPercentage - The percentage used of the lot size. %50 is used for high risk and %5 is used for low risk minimum required $2000. Lot - Initial lot size. MaxLot - The maximum tradable lot size. UseAccelerator - Enable/Disable Accelerator filter. UseAwesome - Enable/Disable Awesome filter. UseEnvelopes - Enable/Disable Envelopes filter. Env_Period - The period used for Envelopes and other indicators. Use for Optimization. InnerDeviation - The Deviation used for Envelopes. Use for Optimization. OutterDeviation - The Deviation used for Envelopes. Use for Optimization. 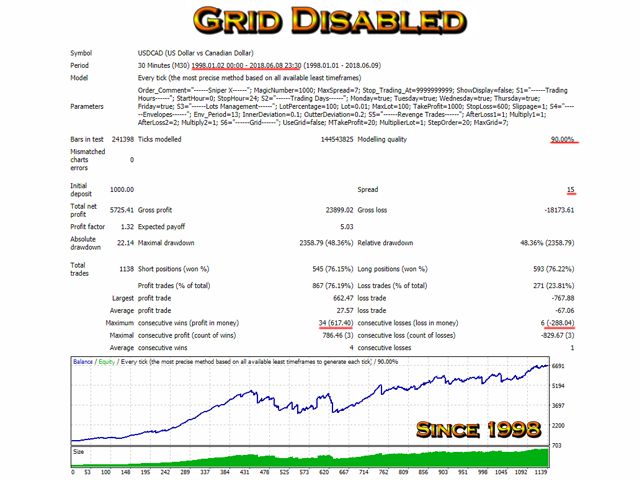 UseGrid - Enable/Disable Grid use. Method - Method 1 is used to take the profit at MTakeProfit. 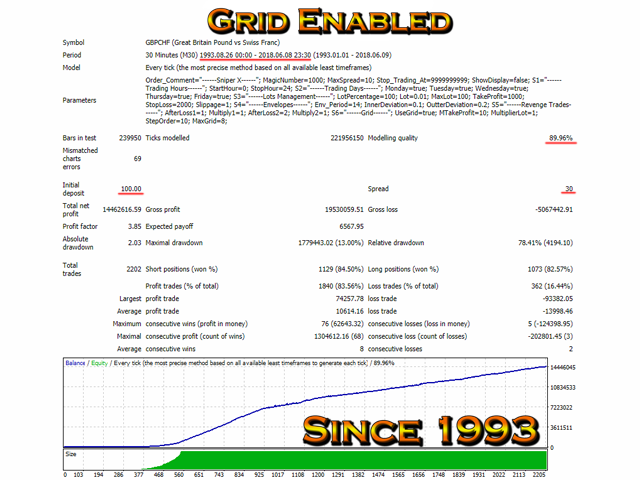 Method 2 is used to take profit at TakeProfit and if the trade goes to use the grid, the grid will end at MTakeProfit. SafeGrid - When trading multiple pairs. If two trades are opened at the same time which will be very rare, the EA will set both trades' take profit and stop loss to 10, as one reaches the take profit or stop loss the other trade will carry on as normal. NoLoss - Close order based on trend. It can be sometimes be a loss. MTrailingStop - Enable/Disable use trailing on all orders of the grid. More Features. Full control. New set files. Less drawdown. Same set files.